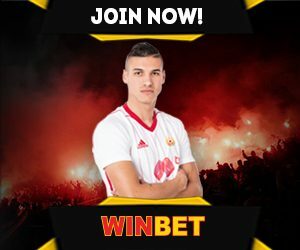 Winbet.bg is Bulgarian bookmakers website, which took a license from the gambling commission in Bulgaria and which, for a very short time, become a reputable and stable bookmaker. The company started with a Bulgarian language version of the site in 2015 and was later translated into English. Winbet has been present for many years as an offline casino business and is a well-known brand on the Bulgarian market. After licensing the bookmaker become to offer online bets. Winbet is gaining more and more customers, not only from Bulgaria, but also from around the world. The site has already been translated into English and for now only those two versions are available – Bulgarian and English. When loading the winbet.bg address in browser, we first notice the company’s well designed webste. The two Sign In and Sign Up buttons are clearly visible. Above is the logo of the company and on the slide we see the latest sports and casino promotions. The main categories in the top menu are: Sports, Live, Casino, Live Casino, Virtual Sports and Promotions. After opening Sport, the live matches that are currently being played are displayed first, then Top Bets. We see a very good selection of sports and especially Football. We can make a few clicks to load our chosen football match. The layout of the different countries leagues on the left gives us quick access to the betting pledges we want and a loaded event has many options. Average there is 100 positions per bet and in the top leagues, we has more opportunities. Winbet have added positions that we do not find in other bookmakers, which is one of advantages. We notice that the site opens quickly, both from desktop and via a mobile device, where the mobile version is up and running. We also reach easy the registration section. Many users are not computer specialists and want quick and easy registration in a few steps. Well, here the bookmaker has made it quick and easy to understand. Click on the top right of the sign up button to open a window, where you fill in your personal details, contact phone, email, and create a profile in step 2 with your username and password. In the deposit method option, you have the option to choose a credit or debit card, as well as a payroll, bank transfer and more. Within a few minutes, you will receive an e-mail from the company with a link to click on and confirm your account. When choosing a deposit with EASYPAY, you do not need to add bank cards, simply by uploading your account with currency Bulgarian lev from an office near you. The money is in your account within seconds after loading. Winbet does not offer many methods of depositing funds, but the basic deposit options, such as debit and credit cards, bank transfer, internet, easypay, epay.bg , cashterminal are available at the bookmaker. Bank transfer, cas are very fast, but bank transfer requires a few days’ waiting period. With a cashier option, you just have to find such a device, hit the Winbet button and write your account number in the bookmaker. The next step is to put a banknote / banknotes in the device. Look at your account at Winbet, the deposit should be confirmed and you have the amount in your betting account. – Starting bonus sports betting up to 200 lv. – Initial casino bonus up to 300 lv. or other currencies. In sports, you have the option to receive up to 200 Euros bonus for a first customer, with a bonus of 50% instead of 100%, however, the bonus is not small, and in order to get the maximum amount of 200lv or 100 euro you have to deposit 400 or 200 euros. The bonus and the deposit must be scrolled 6 times before withdrawing. For the casino the bonus is 100% up to 300 leva or if you deposit a 300 leva you will have 300 leva in your account and you can play with 600. Winbet offers a variety of betting options for Football, Hockey, Basketball, Tennis, Volleyball and virtual sports, which are becoming more and more sought after by players. When opening a football game, you have the option of placing multiple bets, such as 1×2, over, under goals, Asian handicaps, cards, corners, accurate results, and you can also play with one position for two or more events. Example: an exact score of 2: 1, 3: 1, 4: 1 can be played separately, but can also be in one position at an odds of about 10.00. This makes it much easier to play football bets in a system. It is possible to mark a hard bet as well as complete combining systems. The site is well-built, relatively fast and easy to find various sports and desirable events. The odds are good and a live version also offers real-time tracking of the sporting event. – Bonus new client 300 EURO/BGN – 100% bonus This bonus gives you the opportunity to double your deposit, with a deposit of 100 EURO/BGN for example, you will have 200 EURO/BGN for playing in the casino site. The bonus and deposit must be scrolled 20 times to be withdrawn. – Bonus Reload Casino. For players at Casino Winbet who reload, there is a bonus again and this time it is 200 EURO/BGN, again the bonus type is 100% of the amount. Again, 20 times the bonus and deposit is required to be able to get turn over, before withdrawal. In the casino, customers have the opportunity to play over 160 different casino games, such as Slots, Masses, Games – Cards, Keno, Virtual Roulette, Live Roulette and many more. Winbet keep in touch with their clients. They offer fast support and the methods of contacting them are: phone, live chat and e-mail. Their team responds quickly and in details to the questions asked. You can contact them at: +359 92 919 016, support@winbet-bg.com, as well as the chat form, that appears in the bottom half of the site when loading.